While these matters are being followed out by the carpenter, the mason will have started the chimneys, as the roof cannot be finished until the chimneys are topped out. The bricks which are furnished should be carefully inspected and any that are soft, or easily broken by striking together, should be ordered off the grounds at once. The specifications call for good hard bricks. If the contractor is honest he will have ordered suitable bricks, and if they are rejected the loss will be the dealer's and not his. Next in importance to the quality of the brick is the smoothness of the inside of the flues, this is best obtained in unlined flues by cleaning off, with the trowel, the mortar which squeezes out of each joint as the bricks are laid. In some localities it is customary to plaster the inside of the flues with mortar, but there is always danger after awhile that this plastering may become loose and block the flues. Chimney bricks should be laid solid in mortar, so that no cracks are left for the passage of sparks. The best plan, and what is specified in this case, is to use flue linings of vitrified clay. These not only give a smooth flue, but add strength to the chimney and permit the use of four-inch walls everywhere. All ash doors, clean-outs and thimbles should be of ample size, and set as the work goes up, and the withes bonded into the outer walls every six or eight courses. (Fig. 29.) This will not be done unless close watch is kept. FIRST-FLOOR PLAN OF SUPERINTENDENT'S HOUSE, INDIANA STEEL COMPANY, GARY, IND. Dean & Dean, Architects, Chicago, 111. For Exterior, See Page 26. 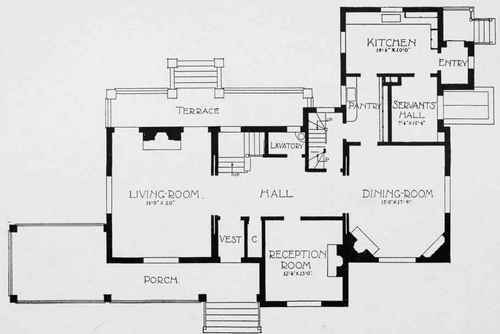 SECOND-FLOOR PLAN OF SUPERINTENDENT'S HOUSE, INDIANA STEEL COMPANY, GARY, IND. Dean & Dean, Architects, Chicago, 111. 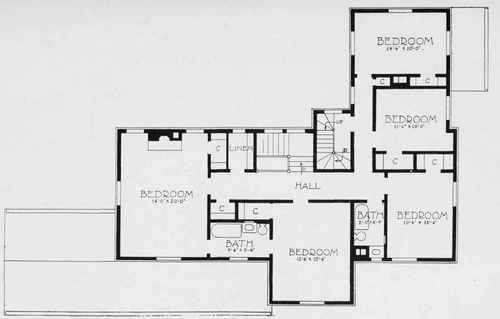 First-Floor Plan Shown on Opposite Page. The rough fireplaces must be formed, with wrought iron bars over each opening, and the outside of the chimney must be thoroughly plastered from cellar to roof. The topping out of the chimney is to be done with the hardest of the bricks laid in Portland cement mortar, and if any enlargement of the chimney is contemplated, where it shows above the roof, this must be done below the roof boards so that there may be no overhanging projection of the bricks just above the roof, as may often be found in old chimneys, for any settlement of the chimney, which is liable to occur, will leave the top supported by the overhang upon the roof and open a dangerous seam at this point. The settlement of chimneys is a matter which it is necessary to consider at all times, as it is almost certain that there will be an unequal movement between the chimney and the house. If the chimney stands upon a ledge or other immovable foundation, the roof will invariably settle a little by reason of the natural shrinkage of the wood construction, but more often the chimney, by reason of its isolated foundation and the general shrinkage of the mortar joints, will be found to have settled more than the roof. This, as well as the danger from fire, precludes the direct attachment of any portion of the wooden construction, and so the chimneys are generally built entirely free and are secured to the frame by strap-iron ties, which will bend enough to adjust themselves to any settlement, either of the chimney or the frame. In the case of outside chimneys where protection from the weather becomes necessary, this natural movement between the chimney and the house must be recognized, and the chimney should be constructed with a projection of brick in line with the frame so that the boarding may run over and break the joint. (A, Fig. 29.) Where the top of a small chimney stands clear above the house for more than ten or twelve feet, it should be stayed to the roof with iron rods. Two rods should be used, spread as far apart as possible at the point of junction with the roof, to give a measure of lateral support to the chimney. Lead for counter flashing is to be furnished by the carpenter, for the mason to build into the joints of the chimney above the roof boarding, and care must be taken to see that the pieces are of good size and are carefully cemented into the brickwork at least six inches above the roof, and ready to be turned down over the flashings which the carpenter will build in with the shingles. Behind the chimney, the flashings must be built in to a height that will allow proper room for building a saddle, to turn the water to either side. The stone caps for the tops of the chimneys will have arrived, and these should be carefully measured on the ground, to be sure that they are of the right size and that the holes for the flues are large enough, and of the right shape and in the proper position. For large chimneys with thick walls, it may be necessary to make the stone cap in pieces and when this is done, the stones must be carefully tied together with galvanized iron or composition clamps. The excessive projection of bricks to form the chimney top is a thing to be avoided, one-half to three-quarters of an inch to each course being all that should ever be allowed. In determining the projection of the top, it must always be remembered that the projection at the corners will appear greater than the natural projection of the courses, and there will be more danger of finding the completed top too large than too small. 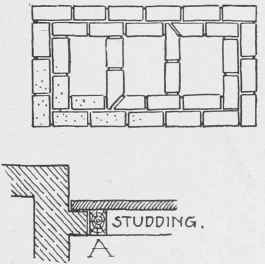 Projections from the shaft of the chimney must be projected on top by a weathering of Portland cement, and where an outside chimney is reduced in size the weatherings should be of stone.